I had an unusual dream last night. In the dream I was inside a room. 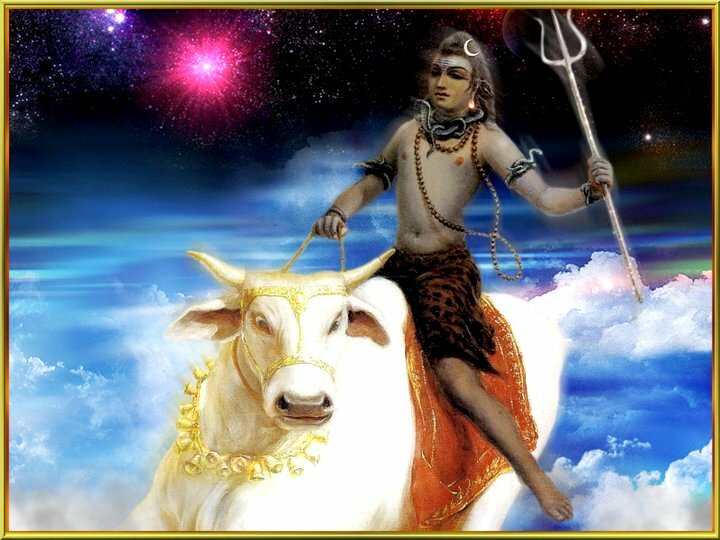 There was a painting of Lord Shiva and His vehicle Nandi the bull hanging on the wall. As I sat in the room I noticed the painting start to shake, a tremendous shaking and thunderous noise emanated from the painting. The portion of the painting which had Nandi the bull started to push outward. Nandi was projecting out of the painting into the room. I jumped up feeling frightened, the noise and shaking was so loud. I rushed out of the room and locked the door to contain the bull. Then the dream faded. Then today I went to Sai Bhajans in Palm Bay. As I sat in bhajans singing I went into an altered state. I had an intense vision of Lord Shiva and saw His crescent moon very huge, I was able to look over the moon and there was nothing but endless space.